ATG Advocates in Washington and at Home | Attorneys' Title Guaranty Fund, Inc. The title and settlement industry is once again in the crosshairs of rule makers in Washington, D.C., and ATG is hard at work protecting the interests of our members and the consumers we serve. In May, ATG joined members of the American Land Title Association (ALTA) in Washington to lobby on behalf of the industry. Organized by ALTA's Government Affairs staff, ALTA members (including ATG representatives) met with more than 200 delegates and staffers in a single "lobby day." 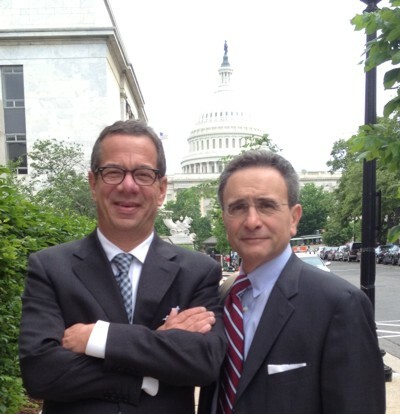 From left: Peter J. Birnbaum, ATG President and CEO, and Frank Pellegrini, Incoming President of ALTA and ATG member. It was a tremendous effort and a great example of the willingness of title professionals to put aside competitive differences and cooperate in advocating for the interests of the land title industry. Our two main concerns are efforts to modify the RESPA and TILA disclosures and efforts to reform or eliminate Fannie Mae and Freddie Mac. The Dodd-Frank Act mandates that the Consumer Financial Protection Bureau (CFPB) combine Regulation Z and Regulation X. The result will likely be a combined Truth-in-Lending disclosure and HUD-1 Settlement Statement. We all shudder at the thought of another change to TILA and RESPA but those changes are coming. The Bureau is in the process of drafting the regulations now and will release its proposed form and regulations by July 21, 2012, and provide for a 60- to 90-day comment period. At that time, we will distribute the draft regulations along with suggested comments. We ask you to submit comments to the CPFB at KnowBeforeYouOwe@cfpb.gov. In our meetings, we articulated our concerns and suggestions to ensure that these changes do not cause significant damage to the industry. The first draft regulations, which have been released for informal public feedback, contain provisions that could negatively impact competition. In our lobbying efforts, we made it clear to the members of Congress with whom we met that promoting fair competition should be a top priority for these draft regulations and the new form. We also expressed our concern about language in the last RESPA rule, which referred to "Optional Owners Title Insurance." We explained to members of Congress the importance of owners' title insurance and asked that any revisions exclude the words "optional owners' title insurance." We make this suggestion, not to imply that owners' title insurance should be required, but to avoid the existing implication that owners' title insurance is unnecessary. We can tell you that the Illinois delegation is very much on our side on this issue. The other issue high on the agenda was the potential impact of the reform of government-sponsored enterprises (GSEs) Fannie Mae and Freddie Mac. Recent proposals to eliminate Fannie Mae and Freddie Mac have gained momentum in Washington. We are concerned that the elimination of the GSEs will severely limit access to much needed capital in the mortgage financing process. It is thought by many that the elimination of the GSEs would also mean the end of the 30-year fixed rate, pre-payable mortgage. While the problems created by loose credit markets have now proven to be devastating to the economy, it is clear that the pendulum has swung the other way and that limited access to capital has contributed significantly to the crash of the real estate economy. The ability to obtain long term prepayable mortgages must be preserved either through the GSEs or through reasonable standards employed by the money center banks. We operate in a highly regulated environment and it is imperative that ATG members and members of the title industry as a whole stay on top of the regulations and participate in the rule-making process. Watch for our future correspondence on this topic and as always, we know we can count on the members to play an active role. An Illinois Supreme Court Special Committee has been working hard to make recommendations to the Court on the foreclosure process in Illinois. The Committee, chaired by the Honorable Lewis M. Nixon, is charged with the following tasks: investigating the procedures currently used throughout Illinois in mortgage foreclosure proceedings; studying relevant Supreme Court Rules and local rules that directly or indirectly affect such proceedings; analyzing the procedures adopted in other states in response to the unprecedented number of foreclosure filings nationwide; reviewing legislative proposals pending in the Illinois General Assembly that may impact the present statutory scheme for mortgage foreclosures; and recommending mortgage foreclosure rules for statewide implementation, with a view toward ensuring fair and efficient foreclosure proceedings. That committee is considering rule modifications and held public hearings in April and June to allow interested parties to comment on the proposal. ATG and several of our members testified on several issues. ATG submitted comments outlining its positions at both hearings. ATG President Peter Birnbaum, CBA President Aurora Austriaco, and Past ISBA President John O' Brien testified at both hearings. Their comments focused on the very real dangers to consumers of engaging unlicensed short sale "negotiators" in short sale transactions and the need for consumers to hire independent counsel when entering into a short sale. They also testified on the problems caused by delays in the foreclosure process and the need to implement rules that allow for faster and more efficient judicial sales. For more information on any of these topics, please contact me. And please watch your email for updates on TILA and RESPA reform --- we'll need your assistance.